Egg Masala is super simple to make and best enjoyed with Indian bread varieties like chapathi, naan and pulao varieties. If you are looking for typical gravy version, Check the Egg Gravy(Muttai Kuzhambu) here which I have already posted.. There are many variations of egg curry depending on the region. This simple curry is a good alternative when you are tired of repeating the same kurumas and subjis. The hardest part to this curry is cooking the eggs. To make it simple, I have given some link on how to peel the hard-boiled eggs with some tips. I suggest to refer them before starting with the recipe. 1). Boil eggs and remove the shell. Make small slits on the eggs with a knife. This helps to get more flavors inside the eggs. Don't slit it deep inside, set aside. Check this link to know how to peel hard-boiled eggs. 2). Heat oil in a pan, add the sliced onions along with a pinch of salt and mix well. Then add the ginger-garlic paste and saute till the raw smell leaves and onions turn golden brown. 3). Add the tomatoes and cook until they are tender and soft. Then add the spice powders - turmeric powder, red chilli powder, coriander powder and cumin powder, mix well. Saute the masala till the raw smell leaves. Add the boiled eggs and mix till the masala is coated well on all sides. Turn off the flame and garnish with coriander leaves. 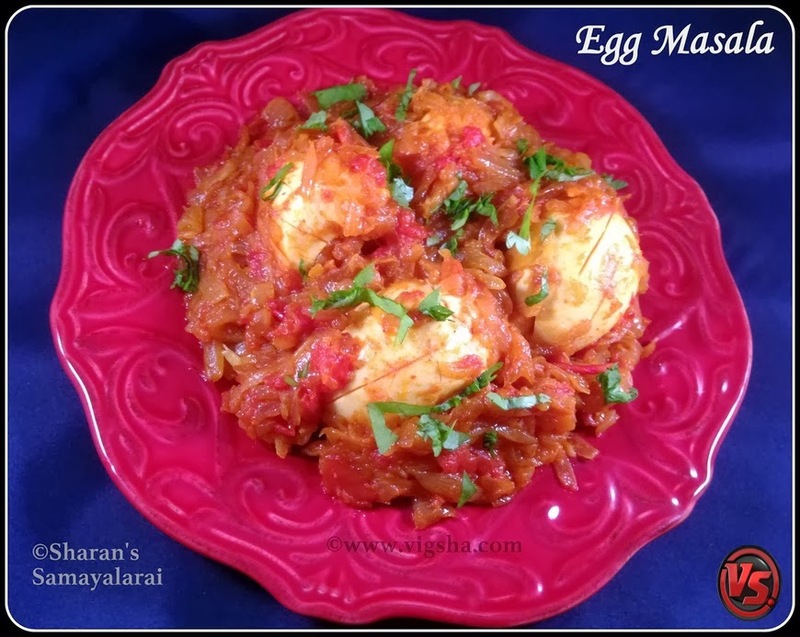 Egg Masala tastes wonderful when served with flavored rice or chapathi varieties. # Add the eggs in the final stage. Over frying might turn the eggs rubbery. # While making slits, take care not to break the eggs. # I prefer the masala to be thick, you can adjust the consistency by using coconut milk or heavy cream. # Adjust the quantity of the tomatoes, depending on your taste and sourness of the tomatoes.